This past January, I was lucky enough to be a part of a wonderful food festival in Tulum, Mexico | Tulum Vegan Fest. So much of my time in Mexico was an eye-opening experience, filled with moments where I contemplated & questioned my purpose, values, goals, & myself. I was surrounded by like-minded people the entire time that I was in Tulum, as well as Mexico City. It woke me up, letting me realize there's people who carry all of the same values and interests that I do, however you simply cannot understand this if you're not in search of it. On the first day, I arrived in Mexico City to visit my cousin David where we would then travel to Tulum, Mexico for the food festival (www.tulumveganfest.com) where I would be leading a plating and presentation class. In a matter of minutes of arriving to DF I was handed a shot of mezcal & a spiked zapote prieto pudding (chocolate sapote) while quickly forcing myself to listen to the exchange of conversation between my cousin & his friends. In only a few hours we'd be catching a flight to Cancun where we would travel to Tulum for the festival. Knowing that we would barely sleep that night due to my late arrival and celebrations with new friends, we went to search for places to eat. My cousin lives in an area of Mexico City that seems a bit desolate at night; Coyocan - where we came across only a few places open with meal (dietary) options for all of us. After visiting multiple restaurants, each kitchen seemed to be closing. Finally, we found a small taco stand were I learned my low sodium tolerance would soon face an all-time high. Holy salt. While in Tulum, We stayed at a lovely eco-resort with architectural details that brought me back to my studies of Gaudi's work at Park Guell in Barcelona. The similarities to his work were spot-on with sloping details, the use of tiles, and incorporating texture and color in an a way that complimented nature. It almost felt as it it was an extension of the jungle that we were so lucky to be staying in. The entire time that I was in Mexico, I slept in a loft as if I was in a (dope) treehouse, both at the resort as well as my cousins 'super chido'/super cool, new place in Coyocan - Mexico City. The resort had so many details that screamed sustainability, eco-friendly & provided an immediate calmness that was so easily absorbed. There were signs that lined the path that quoted things like "this is a stress-free zone" which seemed appropriate with the recent political chaos that plagued both of our countries. 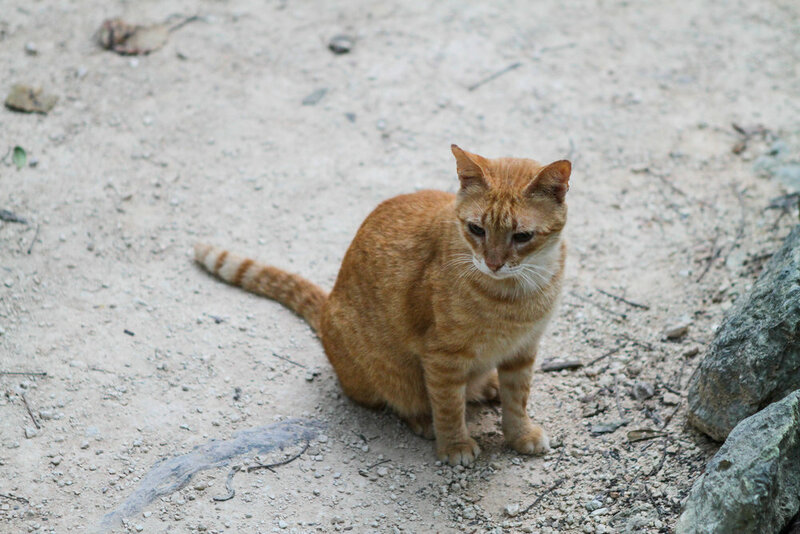 There were even adorable puppies that roamed the resort from the employees who lived on-site, and little cats that followed throughout these woven paths. Upon arriving, I tried my best to speak Spanish and listen to the conversations around me. I knew I'd be one of the very few invitees that would struggle with communication. Verbal communication was a threat at first, but as the week went on, I became more comfortable with the care-free nature of the event, and it's goers. I write verbal communication, for the reason that it may be a necessity if you lost your customs papers (which I did) or to catch a cab. However, the simplicity of a smile, the showcased excitement of surprise, or the warmth of touch will never need a language to understand. We may analyze all of these things, but no words are needed to provoke the feelings that these actions provide. This idea held true while cooking in an open-air kitchen filled with so many different backgrounds. This led me to wanting to communicate through food. After creating a vegan meal and letting it sit for a few minutes to cool, I realized it had been sampled by a few of the workers. Giving me immediate thumbs up and warm smiles, I knew I did something right. After serving a crowd of 35+, every person had an empty plate. Following the class, I was prompted to share recipes for my vegan Poblano Lime Crema and the rest of the meal. While reggaeton may not be Mexico's token genre of music, it was certainly the music we vibed to that night (and my secret addiction.) No words were necessary, communication comes in the form of hip swings, movement, & the exchange of smiles. After 1 hour of sleep, and kicking/nudging my cousin to wake him in his slumber, we jetted to Cancun via taxi to catch our flight back to Mexico City. Running on fumes, we wanted to savor the day and make it to the largest outdoor market in all of Mexico. My cousin was insistent that we (I) cook a vegan meal for 10 of his closest friends. David's dog, Mezli came along for the ride where he ran around making friends with all of the vendors who had food scraps to feed him. People pointed, smiled, and stopped to watch the little lion puppy sniff around or patiently wait for the two of us to finish shopping. Immediately upon arrival to Mexico, you notice that the abundance of fresh vegetables and fruits is a norm in Mexican culture & cuisine. A weekly meeting of friends always seems to occur at my cousin’s house, filled with homemade meals that they practice and experiment with. It's likely they're consuming too much mezcal during these gatherings, but the meals are heavily concentrated with fresh produce which in my opinion levels things out just a bit. This was something that I noticed was lacking in my life here in Miami. David (mi Primo) & I grew up with a family centered around food due to our backgrounds (Mexican, German & Italian) & our family’s love for the outdoors. My mother & grandmother were famous for bringing a huge (and hungry) crowd around the table. There are still jokes to this day about my mom being able to feed 20 people with just a jalepeno (@cookingmark) meaning that she could make a meal with just about anything. “She’s brought the community together” stated our elderly neighbor, for my mom’s beautiful ability to center our time around each other & a good meal. If I learned anything while being in Mexico, it is that there is an abundance of people that are just like you. Ones that share the same interest, the same vision, and the same power that you do when it comes to making change, creating happiness, and stamping an imprint on your heart, however no one will have the same expression as you. When you find these people that share the above characteristics, they compliment what you already express and represent. They build off of this energy and make it better, and make you better. Be in search of similarities, and let others compliment these interests with their own perspectives. This creates growth.